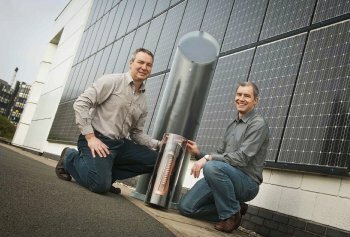 University of Ulster researchers, who have developed a low-cost, solar water heating system, are asking the public to vote for SolaCatcher as overall winner in a prestigious UK-wide innovation competition. The team is through to the final five in the Make it in Great Britain Challenge with their passive solar heating system which is designed for pre-heating domestic water. Each finalist has been voted best in their individual category and SolaCatcher beat off stiff competition from all over the UK to come top of the class in the ‘Make it . . . Sustainable’ group. Online voting is now open at http://makeitingreatbritain.bis.gov.uk/Vote-now and votes must be in by Sunday September 9.